Courtyard Portland Downtown/Waterfront hotel partners with Children’s Miracle Network Hospitals to help the Barbara Bush Children’s Hospital this holiday season. PORTLAND, ME--(Marketwired - Dec 1, 2014) - As the holiday season gets underway, people are more than ever reminded of the need to help one another. And the Courtyard Portland Downtown/Waterfront hotel has a new campaign that makes giving back easy to do. 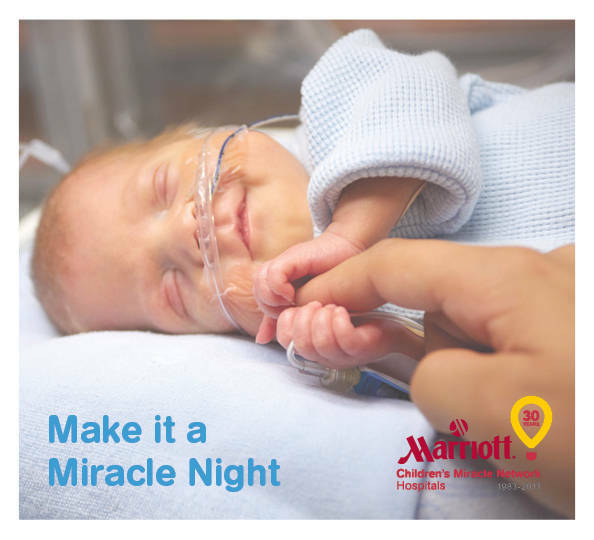 Between now and February 14, 2015, guests will have the opportunity to donate through the hotel to the Children's Miracle Network Hospitals and, in doing so, help save thousands of young lives. Unique among hotels in Portland, ME, the property has launched a 90-day campaign that invites guests to make a donation by adding an amount of their choice to their room rate. The donations will benefit Children's Miracle Network Hospitals, specifically the local Barbara Bush Children's Hospital at Maine Medical Center. Of course, between the season and the stay, guests are likely to be in a giving mood. The hotel's stylish and modern aesthetic inspires both business and leisure guests, whether they're sipping Starbucks coffees in The Bistro in the morning, taking a dip in the heated pool in the afternoon or bedding down for the night in spacious, sophisticated guest rooms outfitted with signature bedding and 42-inch HD televisions. And, as one of the premier hotels near the University of Southern Maine, the property affords easy access to the downtown's best attractions, including the harbor and the Portland Museum of Art. By enjoying their stay at this Portland, Maine hotel near Old Port, participating guests will be able to make invaluable differences to local children. The Barbara Bush Children's Hospital at Maine Medical Center serves as the state's top referral hospital, offering exclusive services and a stellar reputation. Its nurses, for example, were recently rated among the top 3% worldwide for nursing excellence. The relationship between Marriott International and Children's Miracle Network Hospitals stretches back to 1983. As the longest-standing corporate sponsor of the organization, Marriott properties have raised $100 million for hospitals across the country, while Marriott Rewards members have donated countless points to families who need accommodations while their children are hospitalized. Between the plush accommodations and support of good causes, guests of this stylish downtown hotel can look forward to the rare kind of stay where you can feel good about having a good time. The Courtyard Portland Downtown/Waterfront offers an irresistible combination of convenience, style and service. Guests enjoy a range of amenities, from a fitness center and indoor pool, to well-appointed guest rooms featuring spacious desks, luxurious bedding, mini-refrigerators and coffee and tea service. Visitors can refuel each morning at The Bistro with Starbucks coffee and healthy menu items, or relax in the evening over cocktails and dinner. The three function rooms, with their state-of-the-art meeting technology, serve as some of the most attractive event venues in downtown Portland, ME. And business and leisure travelers alike appreciate the hotel's easy distance to attractions like Old Port, shopping, dining and museums. The Barbara Bush Children's Hospital at Maine Medical Center, one of the country's leading children's hospitals, is committed to enhancing the lives of children through excellence in patient care, research and education. With over 51,000 annual patient visits, the hospital is recognized for excellence in cancer treatment, cardiology, neonatal care and numerous other pediatric specialties. From the state-of-the-art hospital equipment and specialty programs, to the spacious children's play areas, Maine's only certified children's hospital is designed with children in mind. For more information, visit www.bbch.org. Children's Miracle Network Hospitals® raises funds and awareness for 170 member hospitals that provide 32 million treatments each year to kids across the U.S. and Canada. Donations stay local to fund critical treatments and healthcare services, pediatric medical equipment and charitable care. Since 1983, Children's Miracle Network Hospitals has raised more than $5 billion, most of it $1 at a time through the charity's Miracle Balloon icon. Its various fundraising partners and programs support the nonprofit's mission to save and improve the lives of as many children as possible. Find out why children's hospitals need community support, identify your member hospital and learn how you can Put Your Money Where the Miracles Are, at www.CMNHospitals.org and www.facebook.com/CMNHospitals. Learn more about this Portland, ME hotel.